Tuscany is a mere jaunt from Rome, and many visitors combine a stay in the Italian capital with a day trip into the Tuscan countryside. Here are some of the top ways to experience Tuscany’s history, art, culture, and cuisine on a tour from Rome. It is possible to see Florence—widely considered one of Italy’s most beautiful cities and an important fixture of the Italian Renaissance—on a daylong tour from Rome. Florence highlights include the Uffizi Gallery, the Galleria dell’Accademia and Michelangelo’s David, the beautiful Ponte Vecchio bridge, and the Duomo’s cathedral and Brunelleschi’s dome. Many Florence tours also include a stop in Pisa to see its famous Leaning Tower. Tour options range from small-group to semiprivate and generally last a minimum of eight hours. Nearly as renowned as its history and art are Tuscany’s cuisine and wine, both of which can be experienced on a day trip from Rome. 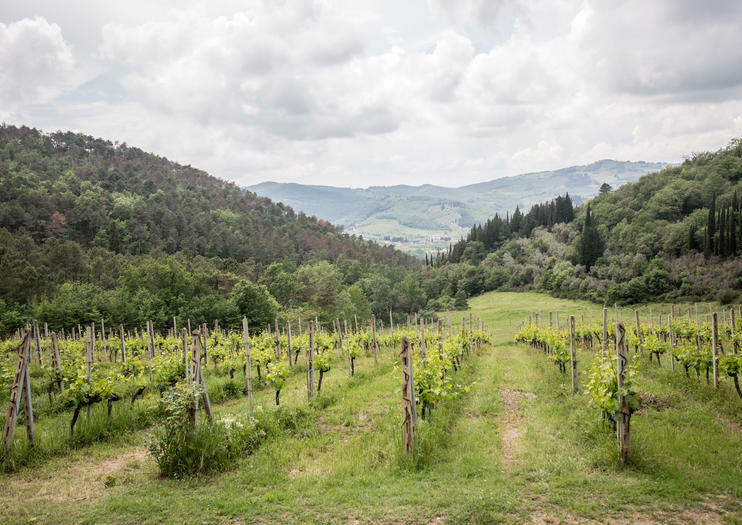 A proper first stop on most wine tasting tours is Montepulciano—both a town and a varietal of red wine—for an introductory taste of the region. Another favorite destination is the famous Chianti wine region. All tours stop at scenic, small villages along the way and include a variety of Italian small bites with the wine tastings. Florence is set about 174 miles (280 kilometers) north of Rome. High-speed train rides to Florence can take as little as 1.5 hours. The Tuscan countryside is about a two hours from Rome by road. Day trips from Rome to Florence or the Tuscan countryside typically run at 10 to 15 hours long, so be prepared for a long day.